Thanks Cat for keeping the blog alive and as I end my month of fun-employment, I wanted to at least have one-post! 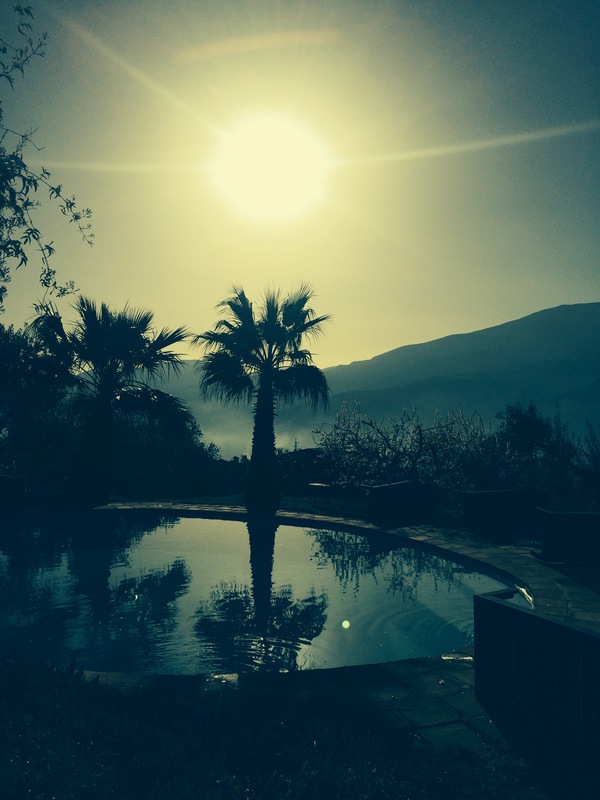 Having just returned from an amazing yoga/cooking retreat in Southern Spain (highly recommend it for anyone interested! ), I am eager to try out all of the gourmet vegetarian recipes that I learned. I especially loved learning about quick, easy techniques that elevate your plates into something from a fine-dining establishment. For example, using small metal round disks for plating/making parmesan crackers to adorn your dishes. I also discovered the beauty of an ice cream machine. We made delicious home-made vanilla ice cream, but also more exciting savory mustard ice-cream for an appetizer paired with red cabbage to a light rose-water sorbet. I am inspired. I only wish that the three of you could have been with me! It was so fun to cook with others, but definitely made me miss you all. As my last hurrah before plunging back into work, I am going away on a girls weekend. It’s almost become a tradition for me to bake something whenever I leave since a) I like leaving a little love behind; b) I don’t particularly like baking; and c) I don’t like sweets/cakes so it’s an added treat for K when I am away. 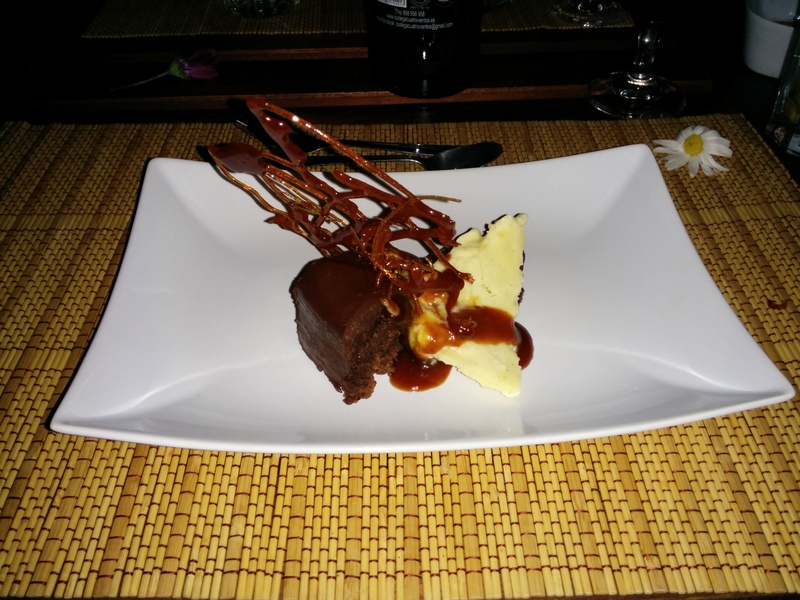 Consequently, this week before my trip, I decided to try to re-create one of the dishes we had at the retreat, which was a flourless, almond (or hazelnut), chocolate cake. – Melt chocolate, coffee, alcohol, sugar and butter on low heat in a sauce pan until everything is mixed; remove from heat, transfer to large mixing bowl and make sure that it is cooled enough for eggs not to cook, but not so cooled it starts to harden. Almond blossoms in full bloom! Holy moly, that looks amazing! Thanks for sharing Aya–you know I’m not a huge sweets person either, but almond/hazelnut meal anything is delicious to me. I’m so jealous of your yoga/cooking retreat. It sounds incredible. 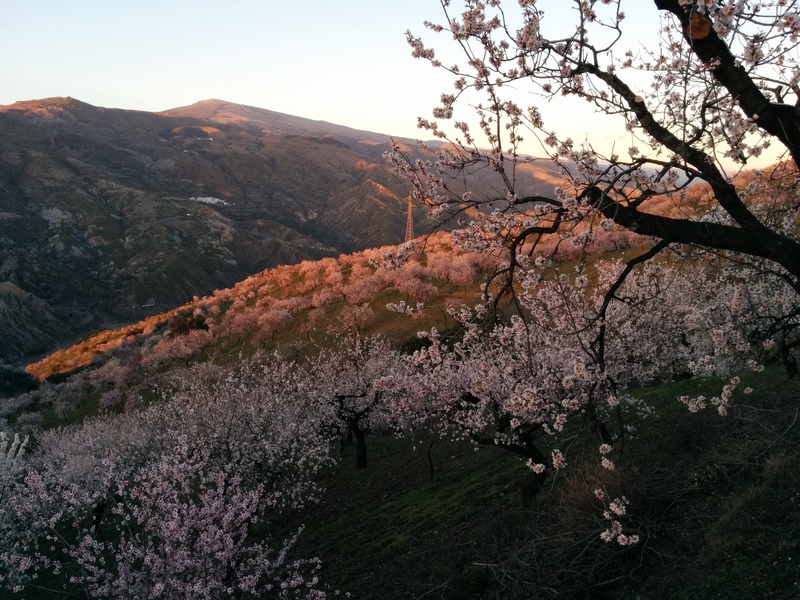 And that photo of the almond blossoms–ridiculous. I’ll try and post a recipe sometime soon. Maybe I’ll try a Caribbean specialty since we’re still in St. J. Lots of love to you and K!